Mike Wajda is the executive chef of Proof on Main, housed in the 21c Museum Hotel Louisville. Wajda graduated from the Pennsylvania Culinary Institute in 2007 and later worked as chef de partie at Restaurant Gordon Ramsay at the London Hotel in New York City. 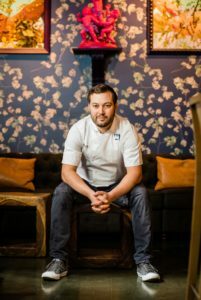 After three years working alongside famed chef Gordon Ramsay, Wajda worked at multiple restaurants up and down the East Coast, including Craigie on Main in Cambridge, Massachusetts. In 2014, Wajda joined Michael Mina Group in San Francisco as corporate sous chef and helped to manage 23 restaurants and over 1500 employees. Throughout his tenure with Michael Mina Group, he helped open seven restaurant concepts around the country, all within one year. As executive chef of Proof on Main, Wajda showcases his unique, modern approach to comfortable and accessible cuisine with a focus on sourcing seasonal produce from Kentucky and the surrounding area. After growing up on farms in Ohio, Wajda developed a passion for using the sustainable ingredients of the region, and his menu at Proof on Main focuses on local purveyors including 21c founders Laura Lee Brown and Steve Wilson’s Woodland Farm.